It's officially opaque tight weather in Ottawa. When I was organizing my closet room this weekend (pictures to come shortly), I came across these deep blue tights. I loved the colour combination of them paired with the chocolate brown shoes so much that I rocked blue legs & brown toes twice recently. What is your favourite colour of tights? These blue tights are the perfect hue. They are great paired with the metallic skirt in your first outfit. Loving the purse in your second look too! I don't have a favorite colour for tights.. but I own mostly black ones with different textures/patterns. your thrifted purses are always the coolest btw! and both of those outfits are classy but at the same time totally fierce! 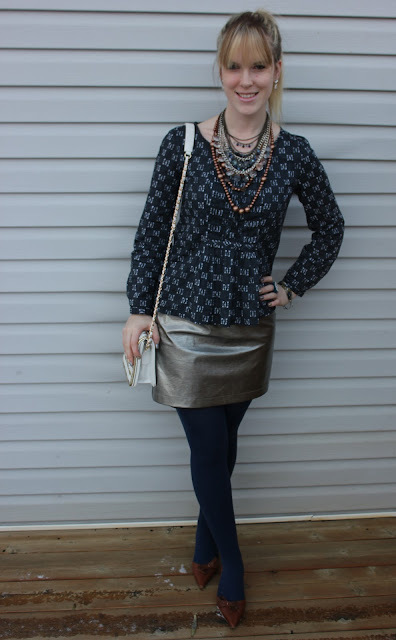 Those tights are gorgeous, and I love them with the metallic skirt!! Tights weather has taken a bit of a break here, but no doubt I'll be busting them back out soon! Love the tights. Playing with colors is the best part of wearing tights. Oh I love your blue tights! They're a much deeper, richer color blue than a pair that I have. Mine risk looking a bit like alien legs at times. I think my favorite color tights are a rust colored pair that I have. And can we talk about how fabulous you look in both of these outfits?? You are so put together and chic! I love it! emily, i am so grateful for the close up shots of the details in your outfits! the metallics: silver, gold, and copper look fabulous. :) your nails, the jewel tones of the blue with the brown, and the dark pinkish red too. that cafe sounds like a fun place, and perfect for you. did you get anything at the christmas craft shopping? bring on the organized closet. Cute tights. My favorite color for tights is either charcoal or deep purple. I want to see pictures of your closet! I love the dark blue tights with your metallic skirt. It looks festive, but in an elegant and unexpected way. Gorgeous Emily!